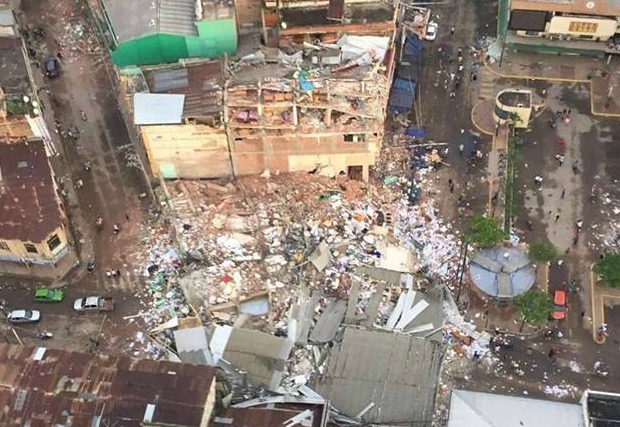 Caritas Internationalis is poised to assist Caritas Ecuador in the aftermath of a deadly earthquake that ripped through the coastal cities in Northwest Ecuador near the border with Colombia on Saturday evening. The 7.8 magnitude quake was felt as far off as the capital of Quito more than 170 kilometers from the epicentre in Muisne. It was felt for more than 40 seconds and many ran to the streets in search of safety. The death toll stands at 350 and is expected to rise. More than 2,000 are injured. El Niño fueled heavy rainfall in recent weeks in two of the hardest hit areas: Esmeraldas and Manabí, have left muddy roads in their wake, compounding aid efforts with the risk of potential landslides. A state of emergency has been declared in six provinces and 10,000 troops and 3,500 police have been deployed to assist the most affected areas. In the aftermath of catastrophic emergencies shelter and water are often the most immediate needs. Caritas Ecuador is an active participant in risk management networks and emergency preparedness efforts. They are currently coordinating relief efforts with the local government to effectively reach those most in need. Caritas Ecuador Executive Secretary, Mauricio Lopez, is in contact with Msgr. Walter Heras, Caritas Ecuador president, to synchronise efforts and create channels of communication to accompany Ecuador during this difficult time.